Both Portugal and the Netherlands go into the final group game of Euro 2012 having had fairly abject tournaments. Netherlands in particular have failed to live upto expectations, with the obligatory Johann Cruyff criticism never far away, scathing media and downbeat fans. Both teams still have a chance of qualification, which should make for a game fraught with nerves, but perhaps an open game as both teams seek to win the game. Netherlands need a win to have any hope of qualifying, while Portugal could afford to draw if Germany beat Denmark. 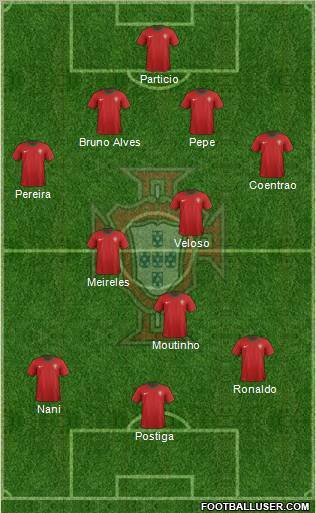 Having beaten Denmark 3-2, it would seem likely Portugal will stick to what just about worked for them. The inclusion of Postiga as the striker has come under a lot of scrutiny but he answered critics with a finely taken goal against Denmark so looks set to keep his place. Meanwhile, we could see a fair few changes for the Netherlands with Van Marwijk the manager under pressure to be more positive and search for the win they need. The debate surrounding Huntelaar and Van Persie could result in seeing both on the pitch. De Jong or Van Bommel could be sacrificed for Van Der Vaart, meanwhile Heitinga, following two fatal errors that cost goals, could be replaced by Boulahrouz. Both teams play fairly similar systems. Firstly, both teams have wide-men who like to drift inside, with the full-backs supporting to provide the width on the outside of them. The modern explosion of “inside out” wingers such as Arjen Robben and pose a big threat to the opposition but they aren’t without problems. The game can become quite narrow, suffocating space for central players to find space, with the full-backs being relied upon to provide width. 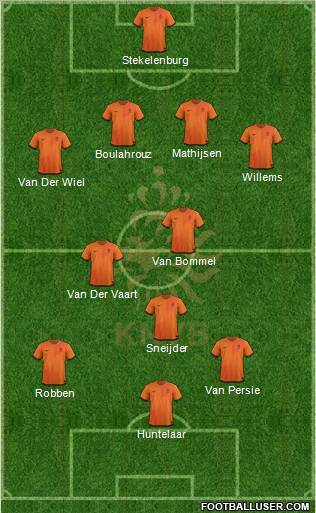 This will be particularly prevalent if Van Persie does indeed line-up as pictured. Sneijder loves to drift to the left hand-side of the pitch and while Van Persie isn’t a natural winger, that interchange could provide Portugal with problems. Both teams will seek to try and keep the ball but both teams can counter-attack with pace and incisiveness. Much will depend on the balance of the Dutch midfield in both keeping the ball and providing more of a cutting edge in the oppositions’ half. Van Bommel and De Jong provide a tough block to break but if the Netherlands wish to win the game, the ball needs to be with other players more often. Van Der Vaart is quite inept defensively, but will provide a bit more when attacking, as seen when he came on against Germany. The Portugese midfield is fairly samey in the way they play, but all three dispatch the ball neatly to the likes of Ronaldo and Nani swiftly. The possession battle could prove decisive in what will be a tense match. If Portugal manage to get most of the ball, we could see Netherlands get more and more frustrated as time peregrinates. Cristiano Ronaldo – Having squandered chances against Denmark and nearly costing Portugal any hope of qualifying, Ronaldo will be hungry to make amends against the Dutch. The Dutch defence has proven creaky so far and susceptible to clever movement and pace. If indeed De Jong or Van Bommel are sacrificed, this could be exacerbated further, for which Ronaldo will be ready to take advantage. Pepe – With Netherlands set to attack, attack, attack, the Portugese defence will doubtless come under severe pressure at points during the game. Pepe is no stranger to wild lapses of discipline and in a tense game such as this, he will need to keep his head against the clever and quick Dutch attacking players. At the other end, Pepe has been a real threat from set-pieces in the tournament so far and there’s no reason to suggest he won’t be again here. The Dutch defence is all at sea and Pepe is set to cause them many problems. Arjen Robben – It’s been a strange season for Robben having often come under a barrage of criticism for his performances, with moans that he’s greedy and that he bottles the big games. This is his chance of silencing some critics. With the Netherlands set to attack, Robben should find plenty of support from his colleagues. Too often in the tournament he has found himself isolated and running down blind alleys. Accusations of him being too selfish has sometimes made him more selfish to try and prove himself, but it’s sometimes made him too desperate to pass it on to prove otherwise. Netherlands’ success largely depends on his mental state.